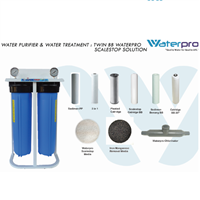 Twin BB Waterpro Scalestop SolutionFor various applications as an alternative softening ion exchange or other conventional water treatment methods. The characteristics of a maintenance-free water filter make it particularly suitable for Foodservice and Commercial applications where equipment maintenance is often overlooked. next-ScaleStop is a great alternative to residential use, especially in areas with salt water discharge restrictions or where brackish water makes it impossible to operate conventional softeners. Drinking Water Depot Package (Minerals And RO)FRP filter water filter tube + manual head 3 way valve.Media dirt and ust removal.Super carbon grade media.plastic tank 1200 PE.HS FIlter 10 in aquakleen clear 3/4.Spun filter 10 ".Filter pleated.Automatic shimizu pump.Ultraviolet system.Box 2 box filling.Gallon rinse tool.Selenoid valve.Depot banner.PVC piping material and electrical radar. FRP TubeFRP tubes or fiber water tubes are made of fibrous fibers that use cast or molding systems to make them resistant to water bursts from pumps up to 7 bar. The 3-way-valve handheld backwash system makes this tube practical on the maintenance process. 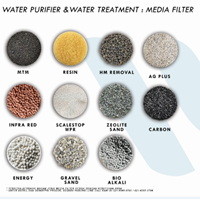 Media FilterWater filter media is a material that serves as a water filter media. Filter material technology is constantly increasing so we can get clean and healthy water.The most sedehana and the most common water filter media is river sand. River sand that has a certain dimension / small dimension capable of filtering the mud that is on the water. But not able to absorb manganese and iron / ferrum and sulfide and other elements that contaminate the water.on the use of ground water the content of manganese and iron need to be filtered for water to be clean. Groundwater is widely used in large areas and cities in Indonesia because the use of groundwater has long been the case even become a habit, usually called water wells. The distance of housing away from the clean river, the uneven supply of pam water in housing causes the ground water to continue to be used.Water filter media has a function of filtering water content that is considered pollutant or harmful. 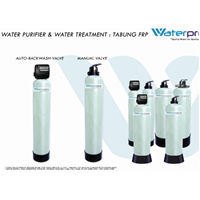 Anda Mencari "Water Purifier & Water Treatment"? 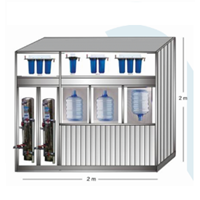 Buat Permintaan Untuk "Water Purifier & Water Treatment"